The Ramallah-based Palestinian Authority's ruling Fatah faction is becoming concerned over rumors Hamas intends to create a Gaza State. The terrorist faction wrested the region from its PA rival in 2007 after months of a savage militia war that was waged in the streets of Gaza barely two years after Israel withdrew from the area. 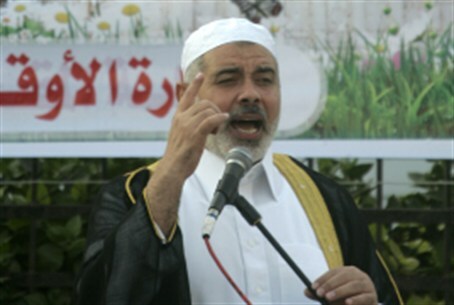 Recently there have been reports the Hamas leader in Gaza, Ismail Haniyeh, intends to declare the region a provisional independent Arab state. At least one Fatah-affiliated website, PalPress, also reported that human rights activist Iyad Srahj, has been involved in brokering contacts between Israel and Hamas over the issue. The site claimed that Srahj was working on a deal to announce a hudna – a long-term ceasefire – simultaneously with the proclamation of a temporary independent Gaza state. Fatah Revolutionary Council Secretary Amin Makbul said in an interview with the al-Raya newspaper that he believes such a move will serve to further isolate Judea and Samaria and PA Chairman Mahmoud Abbas from Gaza. Makbul added that he believes the move is being carried out in accordance with an Israeli plan to accomplish such isolation.